Madonna Dragged For Aretha "Tribute" At VMAs - Joe.My.God. Considering it was the MTV Video Music Awards, one would think that they would have some sort of tribute to the late, great Aretha Franklin — and they did. 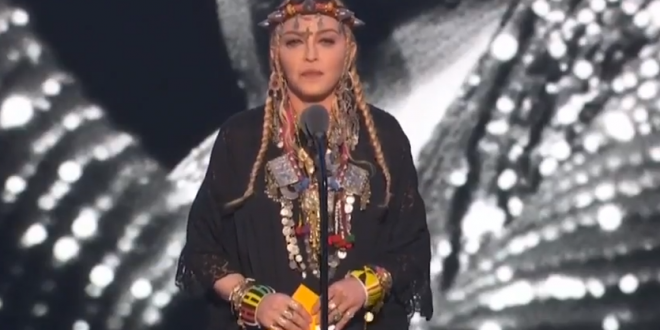 Madonna stepped out on the stage at the VMAs adorned in a graduation robe and what looks like everything from her jewelry box paid homage to the Queen of Soul, but it wasn’t the tribute many people had in mind. Even though Madonna said the point of her story was that her career wouldn’t have happened if it weren’t “for our ‘Lady of Soul’” and ended saying, “Thank you for empowering all of us. Long live the queen”, Twitter immediately dragged, roasted and read Madonna for filth for making the tribute about herself and her journey as a pop star — whether it was intentional or not.